Tip #1: Plan your reststops. Yes, I know, you’re on your trip and you want to get to your destination fast, but when you have man’s best friend with you, you must make stops! Must! No exceptions! The best thing to do is plan your stops before your trip…a 15 minute stop or so every 2 hours is optimum. But you’re on a long car trip! Where should you stop? The best places to stop are the “rest areas” or “picnic areas” you see on your route. Another old standby is Walmart – the Walmart stop is excellent because they are typically right next to the highway, almost always have some type of patch of grass, and also allow you to grab anything you may have forgotten or need! At the reststop you should bring your dog out of the car on leash and let him walk around to poop/peep. Also, give him a nice bowl of fresh water and a little treat! Don’t expect that every rest stop is going to have water. In fact most “picnic areas” along the highway only have picnic tables, and typically only true “rest stops” actually have water and restrooms! Invest in a small gallon jug of water for each dog you have and refill it each chance you get! This piece of advice cannot be stressed enough. A nice 15 minute walk before the long car trip will help the dog get out any excess energy and will prevent a hyper dog jumping around the vehicle! 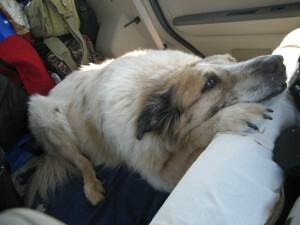 Don’t expect your dog to be crammed up on the floorboard and then to be happy and content! The ideal situation is to have enough room for your dog to lay down comfortably without being squashed. If you have multiple dogs, an SUV type vehicle with the back seats down works great. If you have tons of things you also have in the vehicle that you’re bringing with you, stack it along the sides and give your dogs the space in the middle. Don’t leave your dogs tucked away in the back of the car thinking that they’re cool. Remember, they dont have voices to tell you when they’re too warm! If your car has an AC vent in the back, make sure it’s open and that it is pointed at them. If you don’t have an AC vent, a nice option is to buy a small portable car fan. You can buy them for under $15 at walmart and they have styles both that work through the cigarette lighter in the car and that run under battery power. Just plug it in, turn it on, and clamping it in the back to get the air circulating for your dogs. They will love you for it! This entry was posted in Travel Tips and tagged car trip with dog, car trips, tips for traveling, travel with dogs, traveling. Bookmark the permalink. My biggest issue when travelling with my dog is all the places that don’t allow dogs inside (especially the National Parks, most of them have restriction on dogs on the trails). Do you have any good tips for these situations? The best solution is to pre-plan. If you’re wanting to go to a national or state park with your dog, you should do research before hand to see which parks are more dog friendly – you’ll find that some are much more accommodating than others. For example, Grand Canyon National Park allows leashed dogs on the rim trails…and if you want to go on a trail that does not allow pets, they even have a park kennel on the South Rim where you can board your dog for the day or overnight at pretty reasonable rates ($16 for the day). Many other national parks also allow dogs on at least some trails….the number of trails your pet is welcome on will vary….for example, Acadia National Park is pretty welcoming to dogs on almost all their trails, while Yosemite National Park welcomes dogs on paved trails, but on only a couple of unpaved trails…they do however have a boarding kennel where you can board your dog for the day if you want to go down a trail! It’s also a good idea to bring a padlock with you on your trip as sometimes you’ll find some places that have kennels available for your use, however you’ll need your own padlock. If you do find yourself in a park where dogs are not allowed on the trails, you’ll usually find that dogs are welcome at campgrounds, parking areas, or within a few hundred feet of the roads….many main sites and attractions in parks will fall into this category, so you may have to satisfy yourself with just seeing these “main” site attractions and not getting too deep into the backcountry. A little bit of a sacrifice, but it will be made up for by how much fun you and your dog will have the rest of the time! A final piece of advice, is if you do want to go down a trail for the day and dogs aren’t allowed, you can always check at a nearby town to see what type of day boarding they have. We’ve often driven through towns on the way to National Parks and seen signs up advertising this type of service. Good luck on your trips and hope you and your dog have fun! !